Singapore Airlines: another year of no traffic/profit growth. Betting the farm on premium economy? Singapore Airlines (SIA) reported a slight drop in operating profits at the group and parent airline for the fiscal third quarter ending 31-Dec-2014. But SIA and regional full-service subsidiary SilkAir both remained in the black for the quarter and calendar 2014 despite challenging market conditions which drove losses at most of its peers in Southeast Asia. SIA has outperformed its neighbours by maintaining a disciplined and rational approach to capacity. The parent airline has shrunk since 2008 and the upcoming introduction of premium economy product could result in a further reduction in seat capacity and passenger traffic. But premium economy could also drive an improvement in yields and profitability at the parent airline after several years of declines. Group profitability should also improve as SIA’s two budget airline subsidiaries, which are driving most of the growth, turn the corner. SIA reported on 6-Feb-2015 a group operating profit of SGD147 million (USD114 million) for the fiscal third quarter ending 31-Dec-2014 (3QFY2015) compared to an operating profit of SGD143 million (USD114 million) in 3QFY2014. Group revenues increased by 1% to SGD3.914 billion (USD3.023 billion) including a 2% increase in passenger revenues. These figures exclude Tigerair, which became a subsidiary of SIA in late 2014 as SIA increased its share from about 40% to 55.8%. The group reported a larger net profit for the quarter of SGD203 million (USD157 million) but this was primarily driven by a one-time SGD56 million (USD43 million) gain related to the value of its stake in the Tigerair Group. Tigerair Singapore is now one of five airlines under the SIA Group. Three of these airlines were profitable in 3QFY2015 – SIA the parent airline, SilkAir and SIA Cargo. The parent airline’s profit however declined by 33% as a 1.1ppts drop in load factor to 78.3% offset a slight improvement in yield. SilkAir’s profit improved but on a very low base as both load factor and yield improved. The SIA Cargo operating profit of SGD17 million (USD13 million) is particularly noteworthy as it marked the highest profit for the cargo airline since 3QFY2011. SIA Cargo has struggled over the past four years, accumulating losses of about SGD400 million, due to challenging market conditions. But the December quarter is traditionally by far the best quarter for SIA Cargo, which still incurred an operating loss of SGD17 million (USD13 million) through the first three quarters of the fiscal year. The profit in 3QFY2015 was driven mainly by an improvement in load factor as SIA’s cargo traffic and yield remained flat. The SIA Group’s other two airline subsidiaries, Tigerair Singapore and long-haul LCC subsidiary Scoot, incurred losses for both the quarter and the nine month period. SIA does not yet break out figures for Scoot, which launched in Jun-2012 and currently operates a fleet of six 777-200s and one 787-9 to 13 destinations including Singapore. But Scoot is not yet profitable and is not expected to make a positive contribution until at least FY2017. Tigerair, which continues to have a separate listing on the Singapore Exchange, earlier reported a group operating profit of SGD4.1 million (USD3.2 million) for 3QFY2015 compared to a group operating loss SGD9 million (USD7 million) in 3QFY2014. Tigerair Singapore was roughly break-even in the quarter with an operating loss of less than SGD1 million. Tigerair Singapore currently operates a fleet of 24 A320s to 38 destinations including Singapore. Almost all of Tigerair’s revenues are now generated from Tigerair Singapore as the group in 2014 sold its entire stakes in Tigerair Australia and Tigerair Philippines while closing Indonesian joint venture Tigerair Mandala. The Tigerair Group currently only has a 10% stake in start-up Tigerair Taiwan. However, the group still receives relatively small payments from other Tigerair carriers in exchange for using the Tigerair brand and website. While still unprofitable the budget subsidiaries are crucial components to SIA Group’s long-term strategy as nearly all of the growth opportunities in Singapore and Southeast Asia are at the bottom end of the market. Tigerair Singapore and Scoot combined carried over 7 million passengers in calendar 2014 compared to less than 5 million in 2012. Over the same two-year period SIA passenger numbers have increased by 4% while SilkAir passenger numbers have increased by 6%. SIA’s two LCC brands accounted for 25% of the group’s total passenger traffic in CY2014 compared 18% in CY2012. 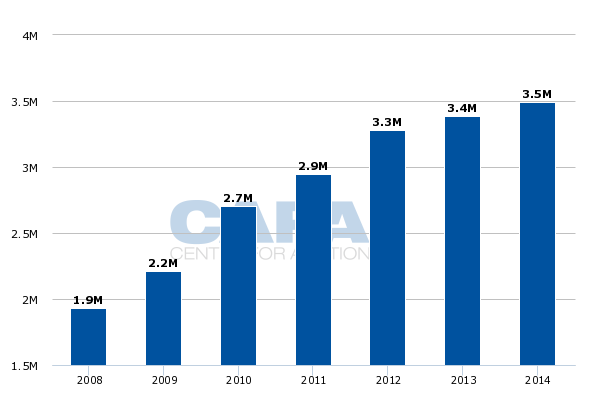 SIA’s passenger numbers in CY2014 were still below its pre-global financial crisis figure of 19.1 million for 2008. Over the same six years total passenger traffic at Singapore Changi Airport has increased by 44% to 54.1 million. Tigerair Singapore has more than doubled in size since 2008, when it carried about two million passengers. SilkAir also has achieved significant growth since 2008, with passenger numbers up 81% over the last six years to 3.5 million. SIA had been pursuing rapid fleet and network expansion at SilkAir as it saw opportunities in the regional market for both low-cost and full-service brands. But over the last year the SIA Group has had to significantly slow down the growth at SilkAir because of the challenges in the regional market. SilkAir’s ASKs grew by 7% in CY2014 compared to 11% in CY2013 and 21% in CY2012. SIA’s ASKs meanwhile were flat in CY2014 while Tigerair Singapore recorded 8% ASK growth. SIA flew 120.3 billion ASKs in CY2014, which represents a less than 1% increase compared to the 119.4 billion ASKs that the parent airline flew in CY2008. SIA plans to continue its very conservative approach to capacity, a sensible move given market conditions and its focus on the top end of the market. SIA has not yet provided capacity guidance for the fiscal year starting Apr-2015 (FY2016). But ASKs will likely be cut slightly because the airline is removing seats from its long-haul aircraft as it introduces premium economy. SIA also has committed to retrofitting 19 of its 777-300ERs by early 2017. These aircraft will experience a 44 seat reduction in economy class, from 228 to 184, as 28 premium economy seats are added. The total seat reduction on the 19 777-300ERs will be 14 seats because SIA is also reducing the first class cabin from eight to four seats while increasing the business class cabin from 42 to 48 seats. The reduction in the 777-300ER first class cabin will make room for the larger business class cabin as the premium economy is added to the section of the aircraft which currently only features economy class seating. The idea in both the 777-300ER and A380 is to cut the economy section and reduce overall density rather than use premium economy to reduce business or first and increase overall density. This is in line with SIA’s premium positioning and a strategy essentially to cede low yielding economy passengers to other airlines or in some cases its LCC subsidiaries. CAPA estimates total seat system-wide capacity at SIA will drop by about 1.5% by Jan-2016, at which point all 19 and several of the reconfigured 777-300ERs will be in service with a premium economy product being offered to 20 destinations including Singapore. CAPA estimates total seat capacity between Singapore and Europe will drop by about 4% in Jan-2016 while seat capacity to the Middle East, North Asia, South Asia, Southwest Pacific (Australia, New Zealand) will drop by slightly more than 1%. Notes: *for these routes changes in total capacity are approximate because various configurations are currently used. All capacity changes to be implemented by early Jan-2016. Reductions will begin in Aug-2015 and be phased in. There will likely be further capacity reductions in CY2016 and FY2017 as premium economy is introduced on more aircraft. SIA is planning to include 24 premium economy seats on its initial batch of 20 A350s, which are expected to be delivered from early 2016. SIA has not yet committed to including a premium economy cabin on its other 50 A350s on order but premium economy will likely be included in at least a portion of this fleet as well as the five additional A380s it has on order. SIA will also likely add premium economy at some point to its eight newest 777-300ERs, five of which are already in service. These aircraft were the first aircraft to receive the new first, business and economy seats which initially was introduced in late 2013. SIA has decided to retrofit its initial 19 777-300ERs with the new first, business and economy seats as it adds a premium economy cabin to these aircraft. The initial batch of 20 A350s will also be receiving the new generation seats. But SIA is holding off on installing the new generation economy, business or first class seats on its 19 A380s as it is currently working on a new product for its five additional A380s, which will are slated to be delivered from 2017. SIA is continuing to invest heavily in improving its in-flight product, recognising the need to maintain its position as a leading premium carrier. Competition has been intensifying at both ends of the market, pressuring yields and profits. SIA is responding by increasing its involvement in the LCC sector while keeping the parent airline focused as much as possible at the top end of the market. SIA is essentially betting that premium economy can generate almost double the current average economy yield, which will be necessary to cover the reduction in seat density. In theory economy class load factors and yields should also improve as SIA sells fewer seats at the lowest fare buckets. Premium economy represents a gamble as SIA potentially risks losing business class passengers as corporations review travel policies in light of the product changes. But if the formula works profitability will improve. 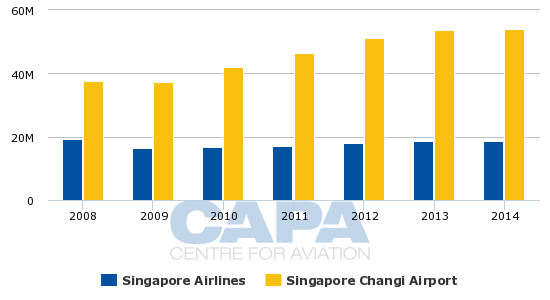 SIA was able to stay profitable in CY2014 despite extremely challenging market conditions. Among the main flag carriers in Southeast Asia only SIA was profitable. But the parent airline’s profits have slipped significantly since 2007 and have been very modest for four consecutive years. SilkAir’s profit also has declined for two consecutive years although the full-service regional carrier has remained profitable. Meanwhile, SIA Cargo and Tigerair Singapore remained in the red in CY2014 with losses totalling SGD128 million (USD101 million). But the outlook for 2015 is brighter across the SIA Group. Tigerair has completed the first phase of a turnaround and will start to benefit in 2015 from closer collaboration with Scoot and the SIA Group. Scoot will in turn benefit from increased feed from Tigerair as well as efficiency improvements generated from the transition to an all-787 fleet. While competition across both the budget and full-service sectors remains intense, market conditions in Southeast Asia are starting to improve. Lower fuel prices should also provide a little relief – even with SIA mostly hedged. And it should be able to hedge ahead at lower prices. 2015 will be a key year for the SIA Group. The introduction of premium economy at the parent airline, with consequential capacity reduction, and introduction of 787s at Scoot are only two of several milestones. The SIA Group is also launching two new affiliate airlines in 2015 – Vistara, a full-service joint venture with India’s Tata which commenced operations in Jan-2015 and NokScoot, a long-haul LCC joint venture with Thailand’s Nok Air which is planning to commence scheduled operations in May-2015. These are all long-term plays aimed at diversifying SIA and unlocking new avenues of growth. Profits should gradually start to rise again. But there will be new challenges to tackle and new projects such as Vistara and NokScoot will always incur losses during the initial phases. Fortunately SIA can afford to be patient.